Cheryl Marquis has sold another Orange County gem! This home, located in quaint San Juan Capistrano, California, is perfect for a family wanting to enjoy the OC lifestyle! 5 bedrooms, 4 bathrooms, and 4,000 square feet, this two level home — nestled safely inside the gated community of Hunter’s Creek — went fast. Not missing any detail, the Mediterranean-style home boasted built-ins, granite counters, recessed lighting, and storage space galore. The open floor plan contributes to the ease of entertaining, with a kitchen (complete with a breakfast nook and breakfast counter!) 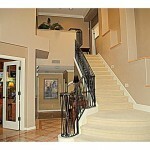 that opens into the family room and a dining that allows for large gatherings. Over-indulge at one your wonderful parties? Just head to your gym / exercise room to burn off any extra calories! Outside, children of all ages can enjoy the spacious backyard, including a swimming pool and outdoor dining area, complete with a BBQ! For more incredible homes like this one, or to inquire about making the OC lifestyle your reality, contact Orange County’s top-producing real estate agent, Cheryl Marquis, today.